We had the opportunity to visit Mission Hill Winery as we make our way across the country - headed to a new chapter and home. I was struck by this winery on so many levels - its beauty, its views...its wine! As we walked around the ground after our tour, we came upon a large bell mounted at eye level. We had heard the gorgeous bells in the tower chiming, yet here sat another and the title on the bell was "Miscast". As we read closer, we learned that the owner had travelled the world for a bell maker for his tower and discovered just the person in Europe - a 7th generation bell maker! Sadly this particular bell didn't fit and so it was decided to mount it where people could see it up close. Printed on the bell were the values of Mission Hill: Heritage, Humility, Truth, Honour, Reflection and Fulfillment, along with the family crest. There was a plaque that talked about how the bell tower was central to the vision for the winery, including the 4 sides symbolizing the transition of the 4 seasons of the winery and of life. 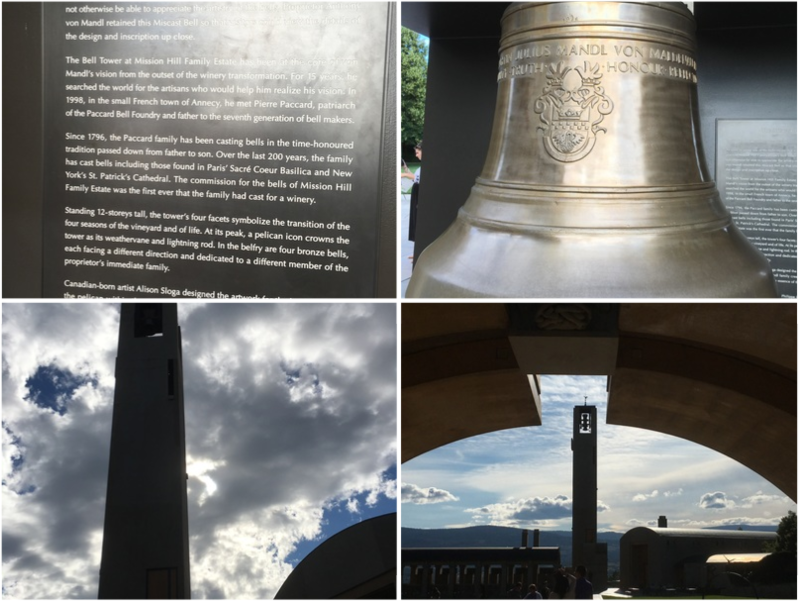 There was so much thought and core values attached to the bell and the bell tower and it struck me that if that bell had not been miscast, it was possible we would never know the story! The accessibility of the bell was a gift that allowed visitors to really see into the heart of what the owner was hoping for. This gave me pause. I'm sure that initially when the bell didn't fit, the scene might have been tense, difficult even. And yet from this misstep came great opportunity. As we travel across the country to start a new chapter in our lives, I am very conscious of the some of the questions about purpose that are purcolating in my mind: how do I want to make a difference in the world, in the next chapter? What are my core values that I will enact in this time? When I am 85 and sitting on the veranda in a rocking chair with my loved ones, what will I feel good about that I have done in my life? Purpose is a big topic. What encouraged me about this bell was the idea that purpose, even purpose gone a little sideways can net some powerful results for the world in which we live. Stay tuned for more on purpose in the coming weeks.